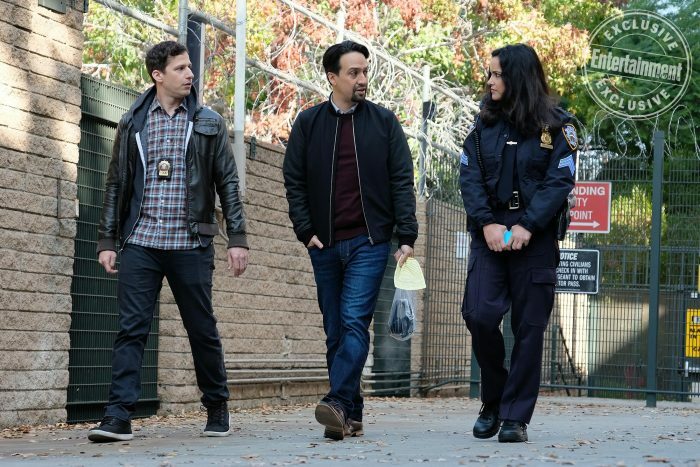 TV Line and Entertainment Weekly debuted two images of Lin-Manuel Miranda’s guest appearance on Brooklyn Nine-Nine in the ninth episode of season 6, “The Golden Child.” According to EW, Miranda will play David Santiago, Amy’s brother and rival — a dynamic that was mentioned back in the show’s pilot to explain Amy’s ultra-competitiveness. And there’s none better to play her accomplished brother than Miranda, who is himself a multi-hyphenate actor, singer-songwriter, and Broadway musical creator extraordinaire. Just getting Miranda to tap into one of those talents would be enough to send Amy spiraling into a frenzy over her self-worth — and be the basis for some comedy gold. Here is the image from EW of Miranda with Fumero and co-star Andy Samberg. While Samberg and Fumero’s characters look a tad intimidated/annoyed by Miranda in this picture, that’s definitely not the case in real life. The three, along with the rest of the Brooklyn Nine-Nine cast, seem to have become fast friends with Miranda after the actor loudly voiced his love for the comedy series on Twitter following its cancellation by Fox last year after five seasons. Now maybe if we wish hard enough, we could get Guillermo del Toro to direct a Halloween Heist episode. You can see Miranda on Brooklyn-Nine Nine on Episode 9, “The Golden Child,” which is set to air on Thursday, March 7, 2019 on NBC. The post ‘Brooklyn Nine-Nine’ Recruits Its Noicest Guest Star with Lin-Manuel Miranda as Amy’s Brother appeared first on /Film.